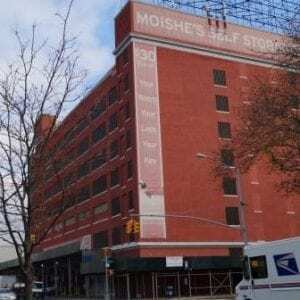 When you’re looking for New York Self Storage near me, Moishe’s is the city’s largest storage provider for over 30 years. Our consistent 5-star customer ratings reflect the excellent service we offer to our customers, in addition to offering the cleanest, affordable self storage units near me with 24-hour access and state-of-the-art security. If you want the best New York Self Storage, feel free to contact an account manager today and experience the Moishe’s difference. From the moment you step out of our spacious double elevators onto every floor of our pristinely clean storage space, you’ll know you’re in NYC’s best storage facility. The low cost we keep comparative to other city self storage providers is our way of providing our customers with the premier storage experience. We assure your 100% customer satisfaction at Moishe’s. When you live within the 5 NYC boroughs, Moishe’s offers free pick up services for our commercial and personal storage customers. With a 3-month commitment to rent storage with us, up to a 5×10’ space, our team of experienced NYC movers will drive one of our trucks to your location, load your things and store them for you, for free. We offer this free trial to all our first-time customers. We are confident you’ll be happy with your service and storage experience at Moishe’s. Why? Because our security standards are higher here than at any other storage facility in the city. Our customers at Moishe’s store with us for an average of 4 years—the longest in the industry nationwide. We provide you with the peace of mind knowing your valuables will stay safe with Moishe’s. We also utilize security checkpoints, state-of-the-art burglar alarms, motion detectors and the latest in fire suppression technology. Where else are you going to find that? Come into a Moishe’s New York Self Storage location near you today or contact an account manager and experience the Moishe’s difference for yourself. With over 20 different unit sizes, including customizable spaces, you’re sure to find the perfect fit for all your storage needs at Moishe’s.